Thank you for visiting. My name is Kevin Sheehan - I'm the cartographer here at Manuscript Maps, which I founded in 2014. Maps are commonplace in today's world, yet many appear clumsy because they are hastily made on computers with concern only for basic function, while ignoring aesthetics, form, and design. Combining my love of maps and my experience as an artist, my mission is to bring art back to cartography. All of my maps are drawn by hand, using traditional techniques employing dip-pens with calligraphic nibs. Each original takes weeks or even months to produce, but I believe that by carefully scribing every letter and drawing every line and shape by hand, rather than relying on computers, my maps are elevated to fine art. Here I sell signed and numbered prints of my hand-drawn cartographic creations, and I also accept commissions for originals. I am greatly inspired by antique maps from centuries ago, when map-makers were also great artists. Often working alone, or in small workshops, master cartographers created beautiful maps that served both aesthetic and practical functions. I studied the height of map-making culture (AD 1200 to 1700) in my PhD, which was awarded by Durham University in 2014. Energised by my historical research, I have set out to create maps using methods employed by map-makers over the centuries. I even draw some of my maps on real calf-skin vellum, just as medieval cartographers would have. The time-lapse video below shows how I draw my maps: detailed planning in pencil, then drawing in pen. This particular map of the island of Lindisfarne took two months to make from start to finish; just the shading of the sea took over three hours! But the result was definitely worth the time. 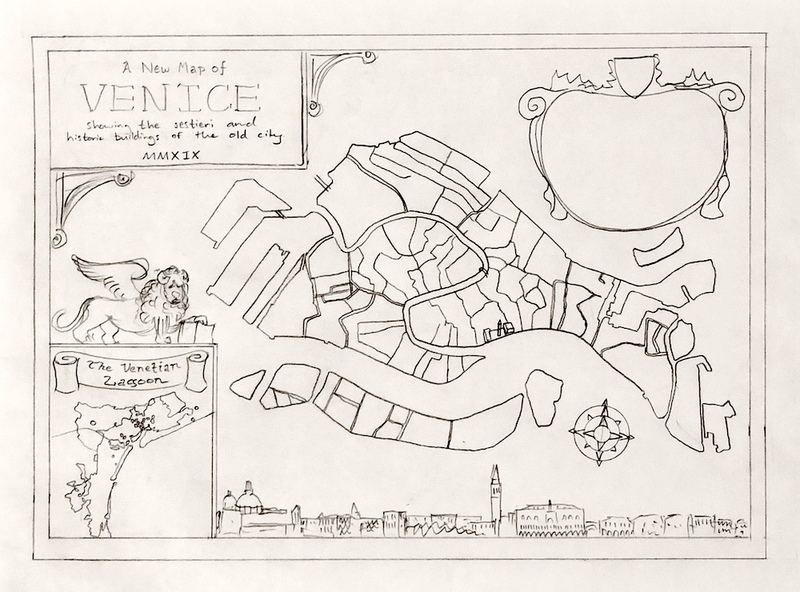 I have just begun work on a map of Venice, and will shortly also be starting a map of the physical geography of Britain and Ireland (both commissions). Later, I will be drawing a map of the ski resorts of Colorado, and by the end of 2019, I hope to have completed a wine regions map of the world. Future plans also include theatres of London, a rum map of the Caribbean, a cheese map of Europe, and maps of Oxford, Cambridge, and Newcastle. If you have any suggestions for future maps, please get in touch! For exclusive discounts, and to get the latest information on new maps for sale, please follow Manuscript Maps on Facebook, Instagram, Twitter, or subscribe below. Sign up with your email address to receive special offers and updates about new maps. We will even give you a 10% discount code! We respect your privacy and comply with GDPR regulations. We don’t like spam any more than you do, so we also promise not to send you more than two emails per month.